Get your mind out of the gutter. It's pronounced "deek". DiC Entertainment was a production company that started as a subsidiary of Radio-Television Luxembourg in 1971, that would go on to produce many kids' cartoons, especially in the 1980s. Its name is an acronym for Diffusion, Information et Communication. Originally founded by Jean Chalopin, DiC was acquired in 1986 by Andy Heyward, who continued to head DiC until its demise in 2008. Heyward is currently the head of Genius Brands International, which he bought in 2015. The company is mostly remembered for its closing logos that appeared at the very end of its shows. Its most notable was the "Kid in Bed" logo, in which a camera zoomed in above a boy who was sleeping in his bed and through his bedroom window, where the DIC logo formed outside. A child's voiceover then says the company's name. This closing logo, first used in 1987, went through various variations before being replaced altogether in 2001. More information on this and the other closing logos for DIC can be found here . 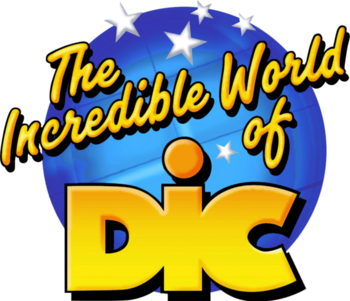 DiC remained an independent studio for much of its days under Heyward's watch, until 1993 when it formed a joint venture with Captial Cities, the then-parent company of the ABC network. It became a subsidiary of Disney after their takeover of Capital Cities in 1996. Unlike ABC, however, Disney had little interest in DiC, and so, Heyward departed from Disney in 2003, taking DiC with him. In 2008, the studio was acquired by Cookie Jar Entertainment, which itself was acquired by DHX Media in 2012. Currently, with certain exceptions, all of DiC's programming archive remain controlled by DHX. DIC worked with TMS Entertainment early on * they also worked with other notable animation companies, such as Sunrise, Toei Animation, AIC, Production Reed, Studio Shaft, Hanho Heung-Up, Studio Pierrot, Studio Gallop and Wang Film Productions during this period, switching to studios like KK C&D Asia, Hong Ying, Saerom and Sei Young later on as Disney and later Warner Bros. were giving TMS more money for their shows. As a result, the higher-quality shows of the company's heyday in The '80s (including Inspector Gadget, Jayce and the Wheeled Warriors, M.A.S.K., Heathcliff and the Catillac Cats, Dinosaucers, and so on) gave way to cheaper cartoons such as the ones based on the Super Mario Bros. and Sonic The Hedgehog video games. It is also infamous among the anime community for its dub of Sailor Moon, although in that case it is often a subject of misblame since the voices, dub script, and most of the editing was done by Optimum Productions. Voice acting since The '90s were (mostly) provided by The Ocean Group in Vancouver, British Columbia, Canada, with some other shows recorded in Toronto, Los Angeles, and Colorado. They also released EasyPlay DVDs in the late '90s distributed by Lionsgate, in which you can hear Inspector Gadget deliver an extremely long and detailed lecture on how to use it. The Wiki Rule: The DiC Entertainment Land Wiki . Limited Animation: Super Mario World, Hammerman, All-New Dennis the Menace, pretty much all of their Dork Age series actually. Some of their earlier shows like Inspector Gadget and The Real Ghostbusters devolved into this over time. Animation Bump: The animation in intros of shows such as Adventures of Sonic the Hedgehog, All-New Dennis the Menace (alternative intro with different animation style , seen in international pre-Cookie Jar releases of "Navy Destroyer") and Hammerman, range from slightly better to way more fluid that the actual feature. This also applies for the Adventures of Sonic the Hedgehog pilot. 13 Is Unlucky: Hammerman, All-New Dennis the Menace, The Get Along Gang, Pole Position, Hello Kitty's Furry Tale Theater, Super Dave: Daredevil for Hire and The Wizard of Oz all ran for only 13 episodes before being cancelled. 65-Episode Cartoon: The Super Mario Bros. Super Show, Sabrina: The Animated Series and more.